ISKANDAR MALAYSIA: The much anticipated Iskandar Malaysia’s 10th Year anniversary celebration was officially launched by Prime Minister of Malaysia YAB Dato’ Sri Mohd Najib Tun Razak in Educity, Iskandar Puteri here yesterday. Also present at the launch was Menteri Besar of Johor YAB Dato’ Mohamed Khaled Nordin. In the past decade, from 2006 until November 2016, Iskandar Malaysia had recorded a total cumulative investment of RM221 billion. This amount exceeds the initial targeted figure of RM141 billion set when the region was first established. Chief Executive of Iskandar Regional Development Authority (IRDA) Datuk Ismail Ibrahim said throughout the 10 years of Iskandar Malaysia’s development, significant changes could be seen in the region; not just economically but also in social development. 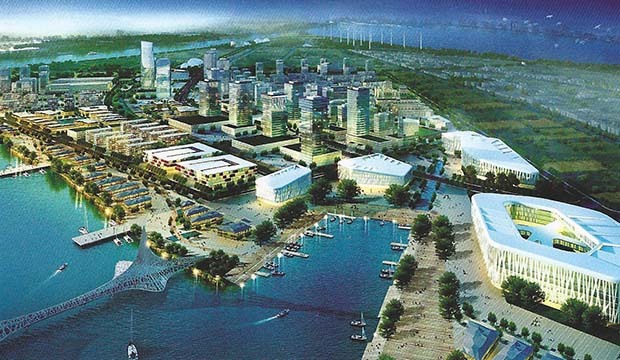 This, he added, was the result of strategic, comprehensive and meticulous planning of the Comprehensive Development Plan Iskandar Malaysia (CDP). “Initiatives to spur socio-economic activities have helped increase household income levels by 14.4% in 2014 compared to in 2012. “Besides that, about 702,000 jobs have been created in various economic sectors including the services sector such as logistics, creative, tourism and education, since the inception of Iskandar Malaysia,” said Datuk Ismail. According to Datuk Ismail, 15 percent of these jobs involved skilled workers and professionals, while 16 percent were for semi-skilled workers. In addition to employment opportunities, Iskandar Malaysia also benefitted the people of Johor and Malaysia through the various business opportunities for entrepreneurs and Small and Medium Industries. “Iskandar Malaysia is on track to realize its long-term goal and we are optimistic that the region will continue to attract a steady flow of investment with projects which benefit the community of Iskandar Malaysia,” he added. Datuk Ismail said Iskandar Malaysia would continue to improve its infrastructure facilities such as connectivity, in terms of public transport, roads and broadband networks. “We also place a lot of emphasis on elevating the people’s quality of life. We are very proud to be the first internationally-recognised pilot in the Low Carbon Society initiative in Malaysia to reduce greenhouse gas emissions,” said Datuk Ismail. Recently, Iskandar Malaysia announced results of the Iskandar Malaysia Greenhouse Gas (GHG) Inventory 2015 at the Conference of the Parties (COP) 22, United Nations Framework Convention on Climate Change (UNFCCC) in Marrakech, Morocco. Based on this inventory, Iskandar Malaysia recorded a 7% reduction in GHG emissions in 2015 compared to in 2010. Iskandar Malaysia is the first in Malaysia to use such internationally recognized standards. YAB Dato’ Sri Mohd Najib also launched the Iskandar Malaysia 10 Year Progress Report during the event, which documents the journey of the region for the past decade, towards realising Iskandar Malaysia’s vision to be a Strong and Sustainable Metropolis of International Standing. At the event, Global Business Services (GBS) was also named as one of the promoted sectors in Iskandar Malaysia in place of Financial and Business Services. Therefore, qualified companies and workers under this sector can also apply for the related tax incentives. Earlier this year, GBS ISKANDAR was launched. This is a specialised programme managed by i2M Ventures Sdn Bhd, which is a subsidiary of Khazanah Nasional Bhd. This programme is to facilitate businesses to locate their GBS operations in Iskandar Puteri and enjoy expert facilitation to meet their GBS location requirements, covering key areas such as talent, infrastructure, liveability and incentives. Qualified companies can also enjoy privileged access to customized incentives provided by GBS ISKANDAR. This is in line with efforts to make Iskandar Malaysia a regional GBS hub. In addition, the village head of the five villages which participated in the Kenduri Rakyat Iskandar Malaysia on November 4, namely Kampung Dato’ Sulaiman Menteri in Flagship A; Rumah Iskandar Malaysia in the Flagship B; Kampung Serkat Permas Kukup, Tanjung Piai in Flagship C; Kampung Pasir Putih in Flagship D; and Kampung Air Manis, Sedenak in Flagship E, were also in attendance. Each of them were presented with an appreciation plaque during the ceremony. Datuk Ismail shared that Iskandar Malaysia had achieved much progress and success due to the unwavering support and collaboration of both Federal and State Governments, as well as the private sector and the community. “For 10 years, we have worked together for the benefit of the people through Iskandar Malaysia. I hope we can continue to work together through our collaborative efforts towards realising the vision of Iskandar Malaysia,” said Datuk Ismail.